This classroom, possibly a kindergarden, contains a slide, a piano, and in the lower right corner a bookcase with toy dishes. 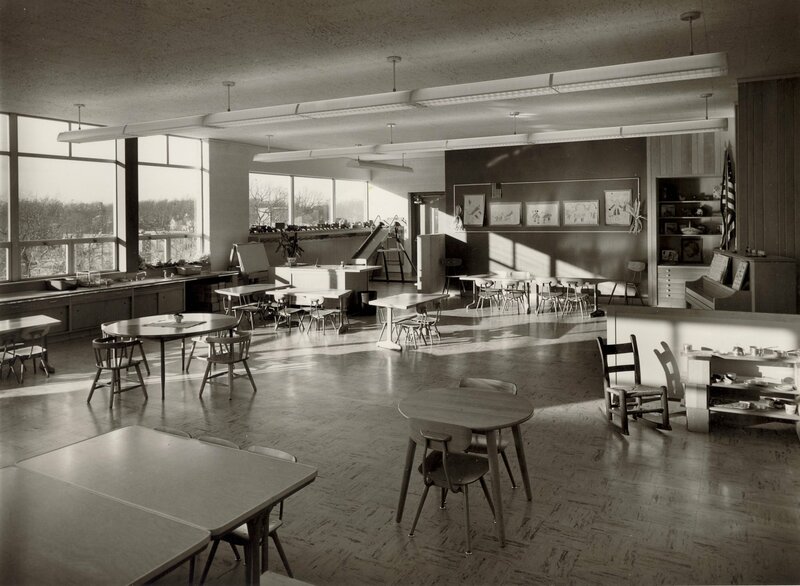 A flag stands next to the piano, children's drawings are displayed on the far wall, there is a counter under the window with an easel on the right, and a teacher's desk to the right of the easel. Several tables of different sizes and small chairs, including a child's rocking chair, are located around the room. The view out the window indicates that the photo was taken during the winter. Title by cataloger. Stamped on back, Gerald Gard, 463 Crescent NE, Grand Rapids, MI, 9F-51.